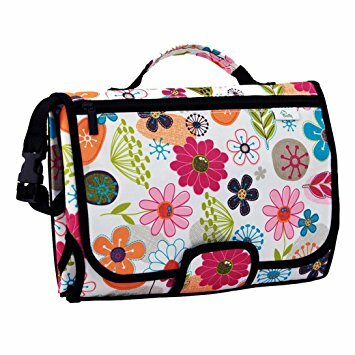 I love being organized and I found the coolest thing for mom's on the go, or in my case, grandma's on the go. 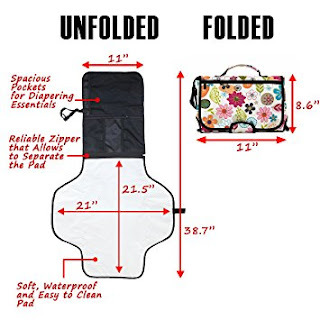 It's Baziliq Portable Diaper Changing Kit. You can take this with you anywhere you go so that everything you need is right there to keep your baby clean, dry and comfortable. Plus it's really cute. I love the bright floral print. It's young and fresh looking, and it's an easy to carry size. Not big and bulky but holds all the necessities. The zippered compartments easily hold 4 diapers, wipes and creams. The actual changing pad is detachable and is ample to change baby on and padded for baby's comfort. I really like that you can easily carry this changing kit with you anywhere you go, whether it's to the park, the grocery store, or a vacation. It makes keeping your baby clean and comfortable easy and convenient. That is a nice kit. I love how it unfolds.